The history of Knox Presbyterian Church began in December 1947 when the Presbytery of Washington City took title of a tract of land on the Northwest corner of Allen Street and Arlington Boulevard in Falls Church, Virginia. The property, which was part of an apartment complex being developed by Eakin Properties of Falls Church, was donated by the developer for church use as a good will gesture to the community. 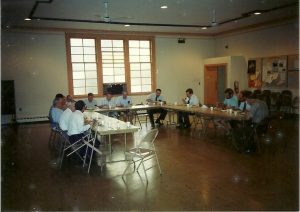 The Presbytery of Washington City soon established a mission in the area, and a number of Christians, who believed in the viability of establishing a church on that site, began to form a group for that purpose. A Sunday School was instituted on October 8, 1950, with classes being held at the nearby Graham Road Elementary School, and this was soon followed by worship services also being held at the school. Worship services were inaugurated at Graham Road School on November 12, 1950, with Dr. Ralph Merker of Washington City Presbytery occupying the pulpit. Knox Presbyterian Church was officially organized on January 7, 1951, when 42 persons were entered on the church rolls as charter members. With the assistance of Presbytery, plans were soon underway to construct a church on the site that was donated by the developer for that purpose. In the meanwhile, worship services and Sunday School continued to be held at Graham Road School. On January 13, 1952, Rev. Leonardo John Testa was installed as the first pastor of Knox Presbyterian Church. In March 1952, worship services were transferred to the Jefferson Theater on Annandale Road just north of Arlington Boulevard, but the Sunday School remained a Graham Road School. The new church building, intended from the start as just a Fellowship Hall with Sunday School rooms in the basement, was dedicated on March 22, 1953. 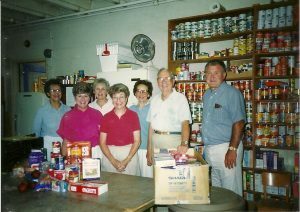 Worship services were then held in the Fellowship Hall using folding chairs as pews, and the Sunday school was transferred from Graham Road School to the basement of the new building. Rev. Testa left Knox Church in February 1958, and a Pulpit Committee was thereupon established to find a replacement for him. During this search period, the pulpit was filled by a number of supply pastors, but mostly by Dr. Donald A.Upton. One of the guest speakers at the time was a seminary student, Carl E. Ericson, who was formerly a photographer for the Associated Press and who lived in the area. The Congregation was impressed with the qualities of Carl Ericson and decided to call him as the next pastor of Knox Presbyterian Church. On June 14, 1959, Carl E. Ericson was ordained as a Presbyterian minister and immediately installed as the second Pastor of Knox Presbyterian Church. Under the guiding leadership of Rev. Ericson, action was soon undertaken to build a Sanctuary for Knox Church. At the completion of Sanctuary construction in 1963 the cost of the church building and furnishings was $173,118.74. The mortgage was $142,000 at 5¾% interest. The mortgage was retired in December 1983. A Building Committee headed by Elder Robert Philleo, a civil engineer by profession, was established on July 7, 1960 to plan and monitor the construction of the Sanctuary Building. After 37 committee meetings and innumerable subcommittee meetings, the new Sanctuary was subsequently dedicated on March 3, 1963. Rev. John (Jack) McFarlane served as Associate Pastor of Knox Presbyterian Church from Ju ne 1963 to September 1966. In July 1967, after service Knox for eight years, Rev. Ericson announced his intention to leave Knox to assist in establishing another congregation in Illinois. Action was then taken to establish a Pulpit Committee to find a replacement. After a relatively short search period, Rev. Douglas T. Ibach was installed as the third Pastor of Knox Presbyterian Church on November 5, 1967. During the tenure of Rev. Ibach, the Board of Deacons, consisting of twelve members, was dissolved due to the reduced size of church membership. 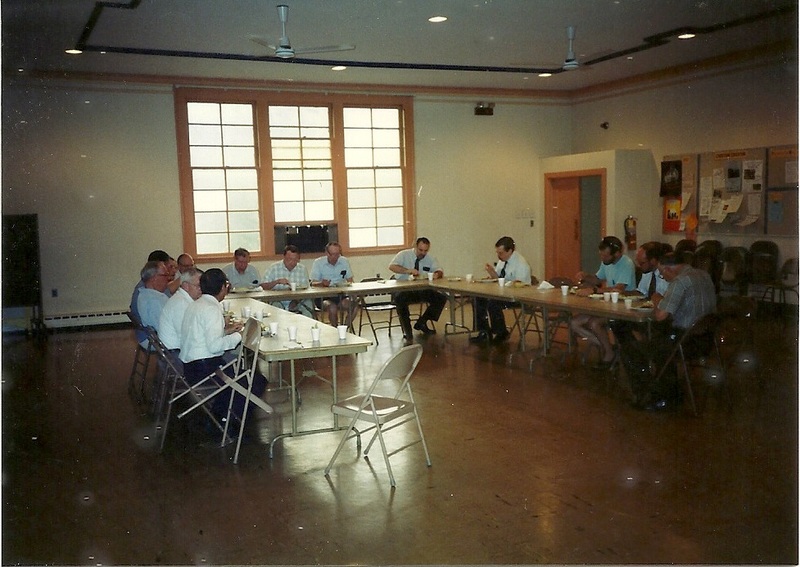 The functions of the Board of Deacons were taken over by the Session, which was increased in size from twelve to sixteen members, to accommodate the additional workload. Rev. Ibach served only five years before terminating his relationship with Knox on May 14, 1972, to undertake ecumenical work in the Reston area. During the subsequent search period, the pulpit was initially filled by supply ministers until Rev. John McLaren became the Interim Pastor of Knox Presbyterian Church. Rev. Gary Pinder of the Lewinsville Presbyterian Churc h in McLean, Virginia also assisted early in this period by acting as Moderator of the Session. Rev. Robert T. Jones, then a staff member of Washington City Presbytery who lived in the City of Fairfax, Virginia, was installed as the fourth Pastor of Knox Presbyterian Church on September 19, 1973. In 1981, the size of the Session was reduced from sixteen members to fourteen members, and in the following year, it was further reduced to twelve. Toward the end of Rev. Jones’ tenure, the church undertook a renovation program, which included the creation of a parlor behind the stage in the Fellowship Hall, refurbishment of the ceiling in the Fellowship Hall, and the u pgrading of the Church Kitchen. After serving as the Pastor of Knox Presbyterian Church for nearly fifteen years, Rev. Jones retired from the ministry in June 1988 to enter the real estate field. A semi-retired minister, Rev. Arthur L. Stanley, served as interim Pastor of Knox Presbyterian Church from September 1988 to March 1990. On March 15, 1990, Rev. William V. Hale became the fifth Pastor of Knox Presbyterian Church. 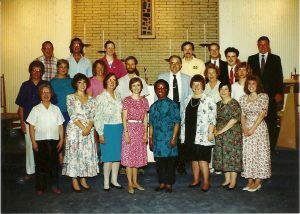 Begun in the early 1990s as a youth musical activity, the Knox Tone Choir has evolved into a more adult membership, which occasionally plays at Sunday morning worship services. Nick Snow has directed the choir for several years, building on the foundations laid by his predecessors, Neal Ostlund and Roger Jones.